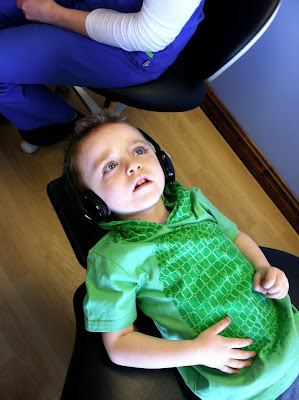 Last summer I took Carson to the dentist for the first time for a cleaning and exam. He had just turned 2 and had all of his teeth in. I was a little bit nervous for that first appointment because I hadn't been the best at brushing his teeth every night and wanted to make sure things looked good. Things looked great and I breathed a sigh of relief. I vowed that from that point on I would be really good about making sure we brushed his teeth every night and flossed. For the most part I was pretty good about it! In fact, Carson liked it when I flossed his teeth and he liked the taste of the toothpaste so he didn't mind brushing his teeth that much either. Some nights he would fight me, but most nights it was ok. In February it came time for his cleaning and exam again. I took him in knowing that he probably had two cavities close to his gum line on 2 of his teeth because I could see the discolor. The dentist confirmed that I was right and we scheduled a time for him to come back and be sedated so they could fill them. I brought him in and they have him some medicine to make him a little loopy before taking him from me. They said they would do x-rays to make sure they didn't miss anything and then they would fill those 2 cavities. They would come get me if anything was wrong. Well, they came and got me about 10 minutes later with some bad news. Carson had 14 - yes, you read that right - cavities. All of them were small and between his teeth because his teeth were so tight together. 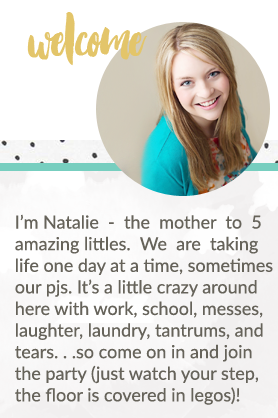 I was devastated and felt like the worst mom EVER! 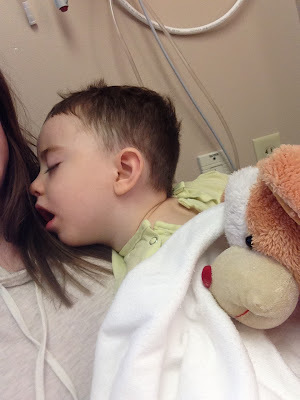 We had to schedule a time at the hospital to bring him in an completely put him under so that they could fill all of the cavities. I felt horrible. My poor baby! On April 1st, Mommy and Carson woke up really early to be at the hospital by 6:30. 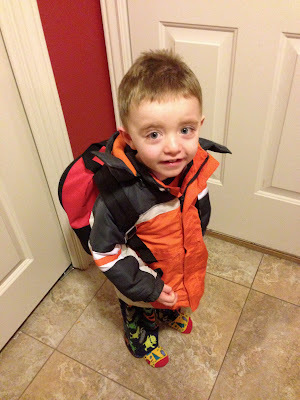 We packed Carson's backpack with games and toys, stayed in our pjs, and off we went. He did such an awesome job while we were there. Doctors and machines don't scare him anymore since he has been around them his whole life. They have him a stuffed dog and some coloring stuff and he was in heaven. My sweet little boy. When they came to get him he let them carry him down the hall and waved goodbye to me like it was no big deal. 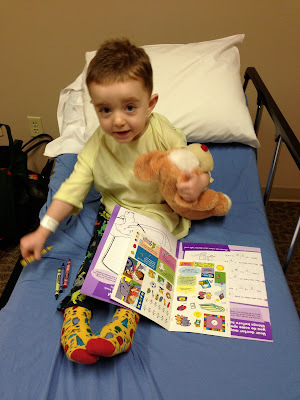 My sweet, brave little boy. The dentist came and got me when they were done and ready to wake him up. 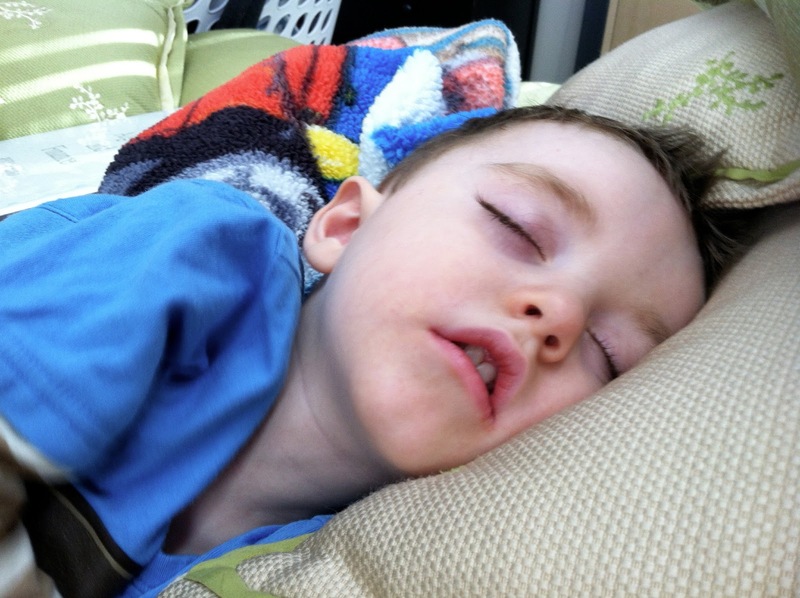 He was having a hard time breathing and they knew he would be a little upset when he woke up. The poor kid was gasping for air and coughing horribly! 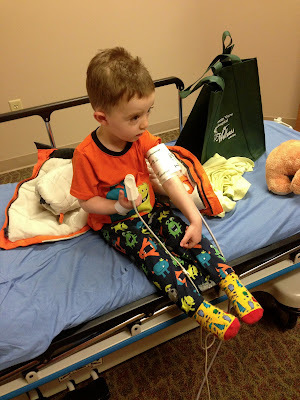 It wasn't that bad with either of my kids when they got their tubes in, so I wasn't ready for that. They gave him a breathing treatment (which he HATED) and I finally got him to calm down and fall asleep on me. He kept asking to go home. As soon as I got him home he was bouncing off the walls like normal. Silly kid! His mouth was a little sore for about a week, but it seems to be just fine now. They actually shaved a little off of his teeth on the bottom front to create space between his teeth. 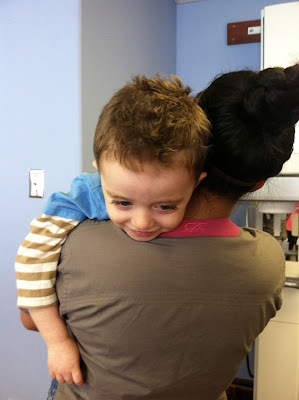 It took care of all of the cavities (since they were so small) and hopefully prevented future ones. His breathing never really got better after he woke up so I took him to the doctor the next day. Turns out he caught croup! Darn kid can't catch a break! I sure hope he doesn't ever have to go through something like this again!